There is something about forgetting that is very important to crafting a good story. Past events are shaped in our minds through patches of haze while points of meaning and imagery poke through the mundane. This is just one of the tangents that Jule Osten, Lauren Harroun and I explored as a series of enthusiastic conversations led to plans of a picnic within the grand Belle Isle Aquarium. The Aquarium is a place not soon forgotten by those who visit. I usually try to weave my observations about each picnic into a piece of writing in two weeks’ time–but I’ve struggled for over a month with the task of describing the unforgettable beauty of the Belle Isle Aquarium. I have been unable to create a tidy narrative; instead a couple of stories shine like quarters in a murky wishing well. Picnic Clubber Augusta Morrison created this lovely document of the Picnic at the Aquarium. Thank you Augusta! Lauren and I drove to the Aquarium filled with anticipation. We were excited to see Jule Osten’s installation within two of the vacant aquariums and hear stories told by Jennifer Boardman, a charismatic volunteer who recalled being the last one through the exit on the day the Aquarium closed in 2005. Immediately after the closure, she began scheming with Vance Patrick about a reopening, an effort that spanned seven years. An enormous pot of “Mock-mock turtle soup” prepared in a herbivorous tribute to Big Pete, a much adored sea turtle who once resided at the Aquarium before meeting an untimely death, sloshed around in the back of the car releasing its fishy aroma. (Watch the video to hear the story behind that one.) Lauren attempted to transform her arms into gyroscopic shock absorbers to prevent the top layer of the bright green birthday cake she carried from sliding onto her lap. We watched with giddy terror as it slid in all directions within its glass dome. The Birthday cake was prepared for Jennifer Boardman, whom agreed to come tell us stories on her birthday. The Belle Isle Aquarium is grand and imposing from the outside, and the interior is equally impressive, resembling a surreal submerged subway station with a diverse collection of creatures representing the Great Lakes and the oceans of the world. We spread our picnic blankets in the center of the grand exhibition hall and Jennifer and Vance stood to tell stories of their love affair with the Aquarium. The gentle and uneven percussion of spoons clinking on soup bowls accompanied her words. Oftentimes museums seem like impenetrable institutions impressing their authority through grand architecture and an air of formality that separates the audience from the authoritative voice of the museum. 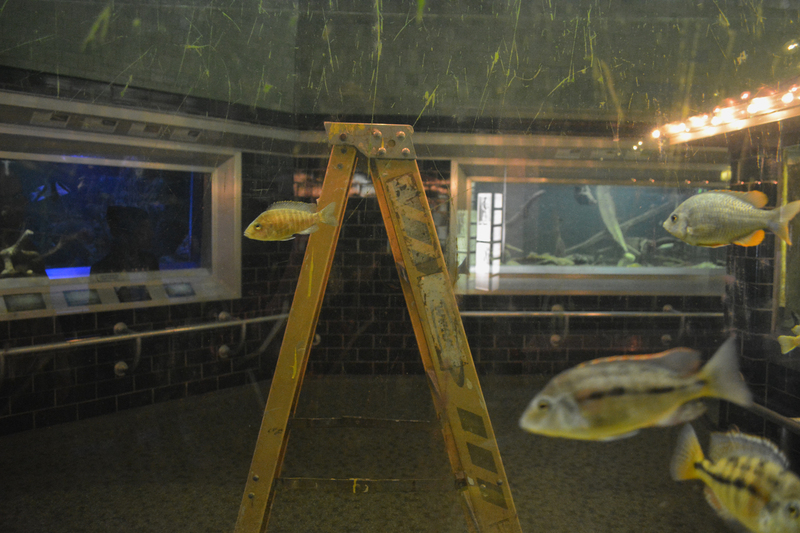 Jennifer recounted tapping on the glass during one of her first visits to the Aquarium. A staff member asked her not to tap on the glass–but the interaction didn’t end there. Instead, the aquarist invited her to step behind the green-and-black-tiled public viewing area to see the baby sea horses. She felt like she had been let in on a secret. That moment was an important one in the history of the Aquarium. Jennifer became one of its most enthusiastic and committed advocates. The Belle Isle Aquarium welcomes artists to create installations in the vacant tanks and even welcomed us to have a picnic after hours. It’s that unique openness that inspires such adoration and volunteerism. 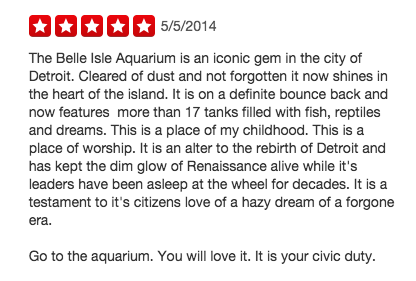 To this day, the Belle Isle Aquarium is run almost entirely by volunteers, and the affection of its patrons is apparent in the many Yelp reviews:It is so much more than a place to admire fish. To its local devotees, it has become a symbol of the city itself. As the Aquarium continues to improve its displays and make structural repairs, I hope that this feeling of openness will persist. I think that it will. 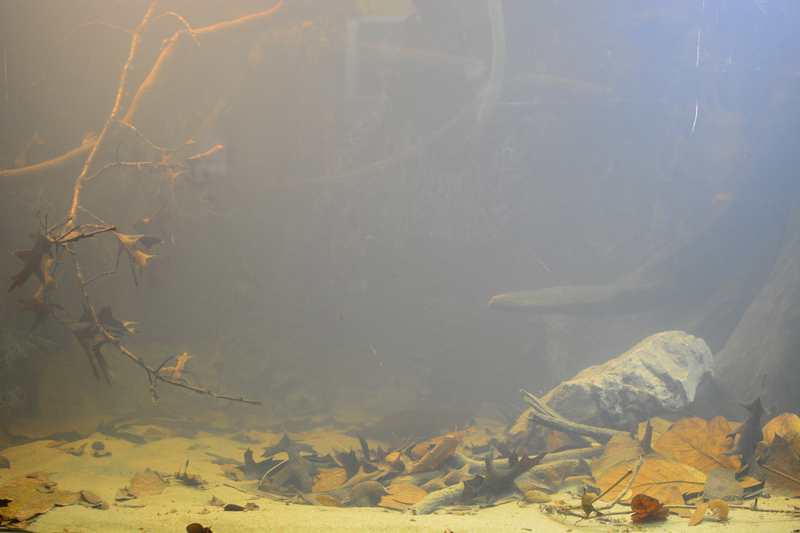 At the far end of the Aquarium, there is a tank that displays no fish. Instead you look through glass into what appears to be a laboratory area, complete with microscopes. This display is a purposeful expression of openness. Through the glass you get a glimpse of the equipment that supports the operation of this place. And you feel like you have been let in on a secret. 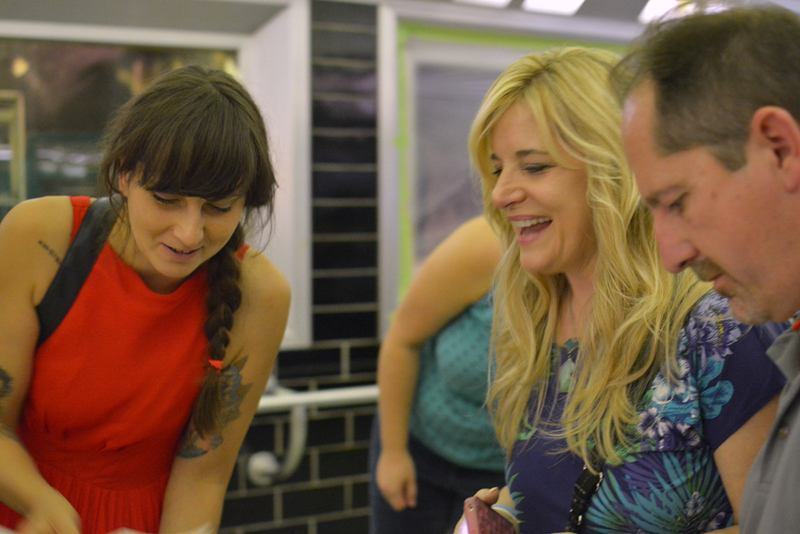 This particular picnic began when we met Jule Osten, an artist-in-residence at Filter Detroit. As with all of our picnics, the pieces fell together as conversations led to ideas, and ideas led to new conversations with new acquaintances, which led to new stories and plans. Jule Osten’s creative output is informed by the ephemeral act of walking. Yet her work includes a focus on research and storytelling, actions that often require a sustained attention to a place. She quickly identifies and represents local narratives in a beautifully minimal and playful way. “The Early Years,” an installation within the Aquarium, is made of windowpanes with phrases that she discovered in her reading set with geometric shapes painted delicately on the glass. The text provokes curiosity, questions more than answers, challenging in its brevity and defying easy inferences about the history or the place. If you are interested in becoming involved with the Belle Isle Aquarium, please visit the website of the Belle Isle Conservancy! 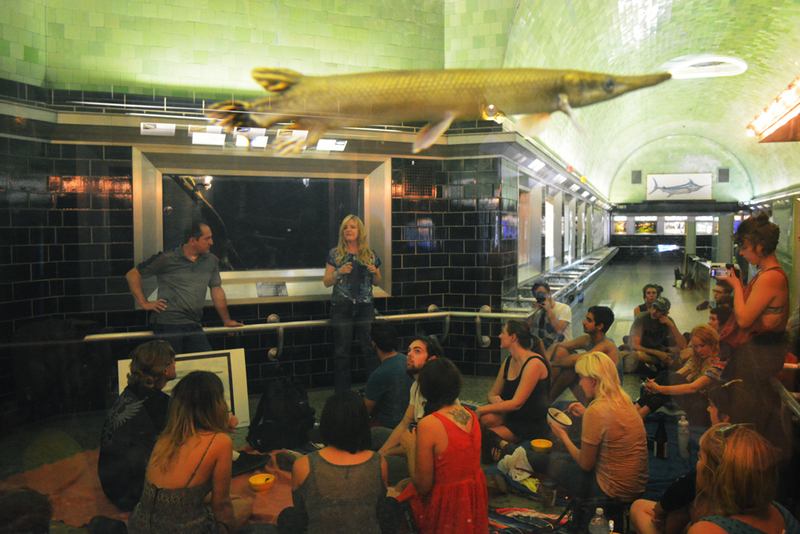 Saturday September 27th, 4:30 p.m.
Join us for a time traveling picnic in the grand halls of the Belle Isle Aquarium! During this picnic we will enjoy a sneak peek of artist Jule Osten’s exhibit within two vacant aquaria. Bring a bowl and a spoon to partake in an herbivorous tribute to Big Pete, a much adored sea turtle who once resided at the Aquarium before meeting an untimely death. Together we will make the gallery of the aquarium reverberate with stories hidden in this magnificent structure. Please arrive promptly, as the stewards of the aquarium are kindly hosting us after the Aquarium has closed for the day. The doors may be locked after 4:45pm. Jule Osten is an Artist-in-Residence with Filter Detroit. She is a researcher, a visual artist and avid walker. As one of the founders of the Institut fuer Zeitreisen she refers to issues concerning time, forgotten stories, historical developments, traveling and walking as a method for her research based art installations and designs.